Let the Wedding Invitation Lighten Your Wedding Ceremony. 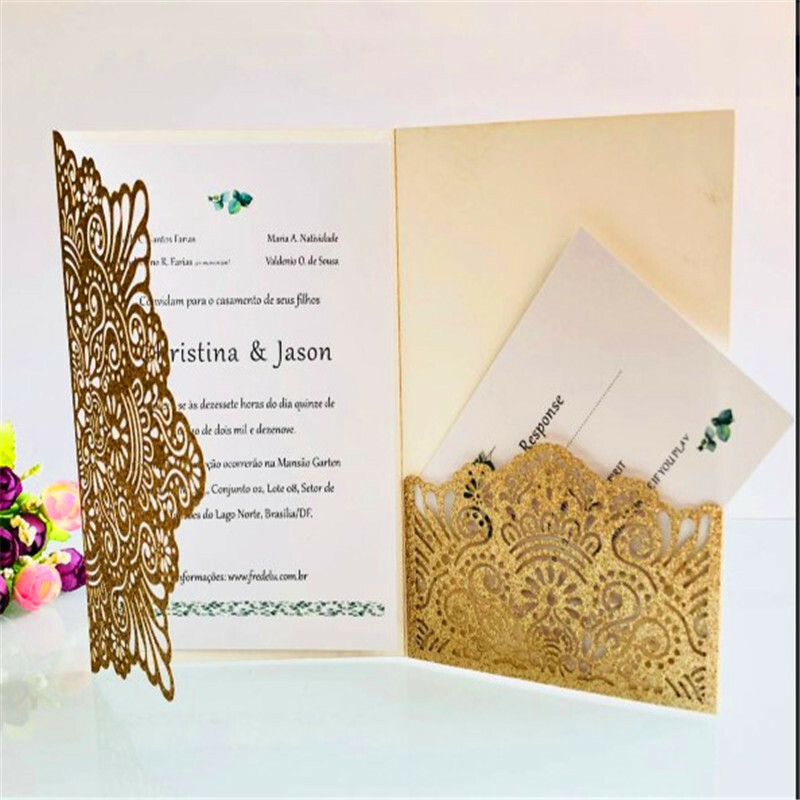 This"Gold Lace Wedding Invitation Cards" is a sure way to impress your guests!! 1, Free personalized card-design service. 2, Any language can be printed. 4, We keep all of your personal information Private. 5, We will ship your order within 3 days after your card info confirmed. 6, 10% discount for your 2nd, 3rd... orders . 7, Trust us, it will save your time. How to Personalize your own Wedding Invitation? # Step1: "Note to Seller" when you checkout or ask for a email to send your wording. If you want to design the inserts by yourself, please send us your wording design in PDF File. # Step2: According your wording we design the inserts for you, then email back a proof for your confirmation within 24 hours. Once getting your confirmation, we begin the printing process. We accept Alipay, West Union, TT. any major Credit Card or Paypal. We will process and ship your order after payment received. It is extremely important for us that you will be 100% pleased with your order. Therefore, if you are not satisfied with the design, paper, or anything else - we will print it again according to your request. Q: What I should do to make the invitation content of my own? A: "Note to Seller" when you checkout or ask for a email to send your wording. we will design for you then send you back a digital layout proof for your confirmation prior to printing. Q: What if I want to buy "RSVP Cards" "Thank You Cards" along with my invitations? A: All the matching cards available. Contact me i will send you the photo and quote a price according to your order. For Customized order, the MOQ is: 30 pieces. Just contact us for a quotation. I will create a listing for you.